These Christmas activities for preschoolers will inspire and entertain your little ones all season long. Crafts and hands-on activities galore! What an amazing collection of Christmas activities for preschoolers! It contains crafts, printables, books, and more! You’ll find everything you need to keep your kids busy and entertained all month long! I love teaching holiday themes to preschoolers. Christmas is a fun one! There’s such an abundance of topics to be covered, and no shortage of books, printables, and themed resources to incorporate into the activities. Below, you’ll find all of the Christmas posts I’ve written to date that you can use with your preschoolers. Be sure to check back frequently, though, because I’m always adding new posts to this list. 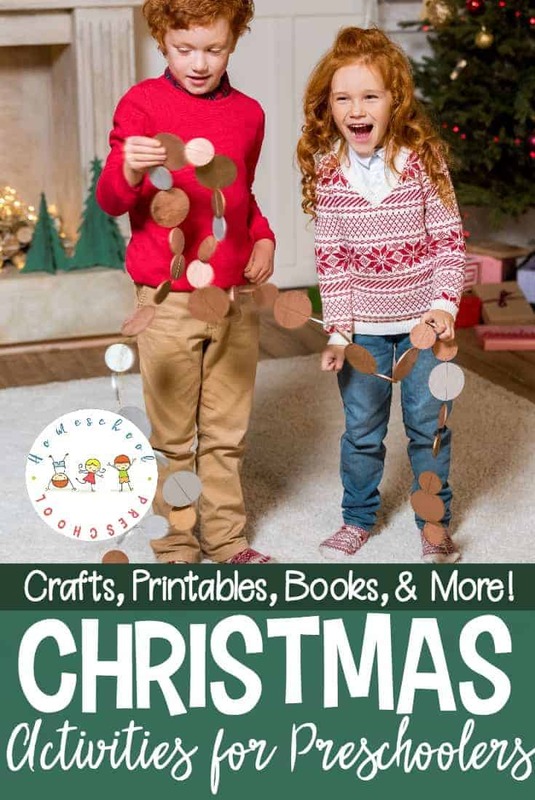 • 90+ of the Most Creative Christmas Crafts for Kids – If you’re looking for some amazing Christmas crafts for kids to do this holiday season, I’ve got the perfect list for you! These Christmas crafts and activities are the perfect way to entertain your little ones through the month of December. • DIY Rudolph Ornaments Your Kids Will Love to Make – Get kids in the holiday spirit with these adorable Rudolph ornaments they can make all on their own! Decorate your Christmas tree or give them as gifts. • How to Make Nativity Christmas Ornament Crafts for Kids – These simple nativity Christmas ornament crafts for kids are not only beautiful on the tree but a perfect afternoon activity for preschoolers! • How to Make Melted Crayon Christmas Ornaments – Kids will love the watercolor look of these melted crayon Christmas ornaments. They’ll also love how easy they are to make. What a perfect motor skill builder! • How to Make an Easy Elf Craft for Kids – Christmas crafts don’t get any easier than this elf craft for kids! With a cardboard tube base and a handful of simple supplies, kids can whip them up fast. • Christmas Memory Game: Counting 1 to 10 – Help your preschoolers practice counting from 1-10 with this fun Christmas Memory Game. Your little ones will work on number recognition and counting with this printable game. • Christmas Racing Pages for Fine Motor Practice – This collection of Christmas tracing pages will keep your little ones busy while allowing them to work on their fine motor skills as they trace each of these Christmas pages. • 12 Days of Christmas Coloring Pages – Add some Christmas fun to your holiday lesson plans. Start with these free 12 Days of Christmas coloring pages based on the popular Christmas carol. • Nutcracker Preschool Learning Pack and Activities – In honor of this year’s Nutcracker season, I created a fun preschool printable to kick off your holiday learning season. • Preschool Reindeer Printable Math and Literacy Activities – Keep preschoolers engaged this holiday season with this set of preschool reindeer printable math and literacy activities. Perfect for December preschool centers! • Free Printable Christmas Memory Game – Are you looking for some fresh new Christmas activities for preschoolers? 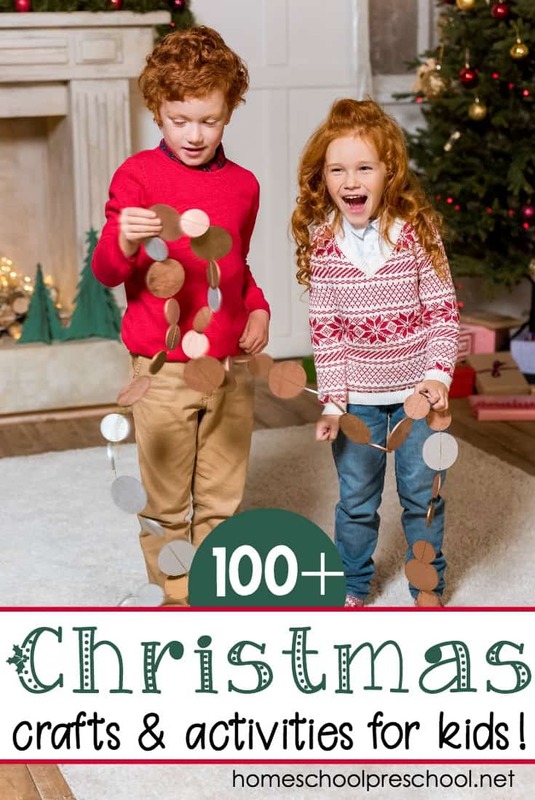 Download this free Christmas memory game for a quick and easy activity! • Christmas Countdown and Letter to Santa – I’ve created a fun Countdown to Christmas page your preschoolers will love! And, I’ve got a Letter to Santa template your kids can use to write out their wish lists. • Countdown to Christmas with Advent Activities for the Family – It’s December! Time to anticipate a visit from Santa, bake lots of cookies, and focus on the birth of our Savior. The countdown to Christmas is ON! • 12 Ways to Have a More Christ-Centered Christmas – How can we keep the focus on Christ in the midst of all of the holiday festivities? Here are twelve Christ centered Christmas ideas you can use with your preschoolers. • 11 Elf on the Shelf Ideas Your Preschooler Will Love – Doing Elf on the Shelf with preschoolers is so much fun! If you are looking for some quick Elf on the Shelf ideas, here are some to keep up your sleeve. • 25 of the Best Educational Board Games for Preschoolers – Whether you’re gearing up for Christmas or an upcoming birthday or you’re just looking for something new to add to the game closet, this list of educational board games for preschoolers is the perfect place to start. • Elf on the Shelf – A timeless Christmas tradition that the whole family can enjoy! • Melk, the Christmas Monkey – Melk, The Christmas Monkey, is an excellent tool for teaching God’s character to children through 30 fun Bible lessons and activities that the entire family can enjoy during the Christmas Advent season. • The Ultimate Christian Holidays Printable Collection – FREE printables include Random Acts of Christmas Kindness, Christmas light scavenger hunt, advent reading plan, and more!